CSI Pacific is seeking 4 new Volunteer Directors to join our Board of Directors for 2019-20. We are looking for team players with a strong knowledge of sport and business acumen, board and policy development experience, and a passion for the work CSI Pacific does in supporting athletes and coaches in BC to reach their highest potential. In addition, if you have a recent background as a high performance athlete, Indigenous sport perspective, para sport background, and/or accounting & finance experience with a CPA designation, we would love to hear from you! Download the Board Application Package [PDF] for more details. Application deadline is Friday March 1, 2019. See Application Package for submission details. Margaret Mason is a partner with Norton Rose Fulbright Canada LLP and provides counsel to a wide range of not-for-profit organizations and charities. She has over 30 years of experience working with the voluntary sector and is a frequent writer and speaker both nationally and regionally. Her practice spans a broad range of issues which affect charities and not-for-profits including tax exempt status, governance, international programs and social enterprise. Margaret represents organizations across the sector including family and corporate foundations, religious organizations, healthcare, education, sport, international aid, research and social services. Margaret assists charities and not-for-profits with their corporate structuring, charitable registration and regulatory compliance issues and has particular expertise with respect to governance and social enterprise. She also provides general commercial advice to not-for-profits and charities. Margaret also advises donors with respect to their philanthropic planning and has extensive experience with trust and estate related matters including all aspects of estate planning and the administration of estates and trusts, both within Canada and elsewhere. Lance Macdonald is an Investment Advisor with National Bank Financial operating his practice in Kelowna, BC. He specializes in helping a small number of families strategically manage their financial assets. He graduated from UBC in 1997 and holds several financial designations. Lance was heavily involved with Alpine Skiing through the 90’s and has participated in a variety of sports including triathlon, climbing, mountaineering, and various recreational leagues. Married and father of three, his own children are now pursuing sport actively, with both his daughters having participated in separate BC Games (Badminton and Freestyle Skiing) and the 2016 International Children’s Winter Games in Innsbruck. Non-profit volunteer work has been a staple through Rotary International for Lance (his family hosted their seventh Rotary exchange student in the fall of 2017!). He also sits on the board of directors for his local Rotary Club and the Kelowna International Children’s Games committee. Jack is currently a faculty member of the School of Education in the Faculty of Human, Social and Educational Development at Thompson Rivers University (TRU) in Kamloops, BC. Jack was awarded a Doctorate in Educational Leadership and Policy from the University of British Columbia in 2004. Jack has had extensive experience in physical education, recreation, and sports, having spent over 20 years in this field in the Canadian Armed Forces in a variety of leadership and teaching roles that included Director of Athletics at Royal Military College in Kingston, Ontario, Commanding Officer of the Canadian Forces School of Physical Education and Recreation in Borden, Ontario, and Director of Physical Education, Recreation and Amenities for the Canadian Forces. Jack is a Past-president of the Coaches Association of BC, former Co-Chair of the Minster’s Advisory Council for Sport and Recreation, and Past-Chair of the Board of Directors of The PacificSport Regional Centre Interior BC in Kamloops. Jack was recently recognized for his volunteer work in Kamloops as one of Kamloops Best 150 Community Builders and Volunteers. In February 2011, he was appointed to the Education Advisory Committee of the Vancouver Foundation. Jack is currently the coach of the TRU Cross-country Running Team, which he has coached for 8 years. He is also an elite Masters competitor in track, road racing, and cross-country running. He has completed 54 marathons to date, too numerous-to-count half marathons and 10k races and plans to keep running and competing for many years to come. Blair Whitmarsh holds a PhD in Sport Psychology from the University of Alberta and is a professional member of the Canadian Sport Psychology Association. Blair has been able to combine his experiences as an athlete, coach and researcher while giving lectures and conducting workshops/coaching clinics in the areas of mental preparation for sport and peak performance. 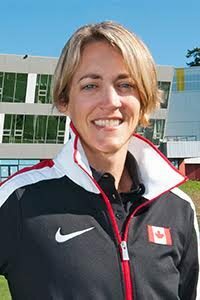 Since entering the field of sport psychology 20 years ago, Blair has consulted with numerous provincial, national, and international athletes from the sports of ringette, hockey, baseball, volleyball, swimming, gymnastics, track and field, and dance. He is the sport psychology consultant for the Trinity Western University Sports Program (volleyball, basketball, and soccer), and provides mental training for a number of elite and professional individual athletes. Blair has been consulted by bodybuilders and strength trainers looking to enhance their training and performance. He has regularly contributed to the popular magazine, Muscle and Fitness, and his articles have appeared in many other related publications such as Muscle and Fitness Hers, Oxygen, and Muscular Development, and Inside Fitness. He has authored a book called Mind and Muscle – combining the latest research and essential experiences related to the mental and physical sides of serious strength training and bodybuilding. Blair is the Dean of Human Kinetics and Athletics at Trinity Western University in British Columbia. He also served as the Education Chair for the White Rock Christian School Board. A resident of Langley, British Columbia, Blair enjoys running, cycling, indoor rowing, weight lifting, and reading. Chris Ireland is Senior Vice-President, Planning Services at PPI Advisory, where he leads the national planning services team to provide advanced professional expertise and support in financial, estate and succession planning. He joined PPI in 2003 with over 20 years of experience in tax, estate and trust planning including several years as a Tax Partner in the Vancouver office of an international accounting firm. He received his Bachelor of Commerce from the University of British Columbia and is a Chartered Accountant (CA) and Trust and Estate Practitioner (TEP). Chris has taught and coordinated the CICA specialized tax course, “Advanced Tax Issues for the Owner Managed Business” and has written extensively in the area of tax planning and wealth preservation. Chris is a member of a number of industry associations including CALU and the Canadian Tax Foundation and is a frequent speaker at tax conferences and professional industry meetings. Robert (Bob) Gurney has been actively involved for many years as an athlete, coach and administrator in a variety of sports. Bob is a graduate of Seneca College (Outdoor Recreation Diploma), University of Alberta (BPE and M.Sc) and achieved his Ph.D from Monash University in Australia. Bob is an academic, researcher, consultant and entrepreneur in business, sports management, coaching and sports sciences and medicine. His current research projects are: 1) psychological contracts and coach-athlete relationships, 2) motivators and barriers to physical activity participation, and 3) change management in professions and multidisciplinary organizations within sports sciences and medicine practices. Bob writes a monthly article for the50zone.com/health. He continues to be active as a Learning Facilitator with Coaching Association of Canada and Sports Medicine Council of BC. Bob is an advisor to Sports Medicine Council of Alberta and Coach Alberta, and maintains a professional membership with Sports Medicine Australia. Bob also works as a sessional lecturer with Grant MacEwan University – School of Business and, University of Alberta – Physical Education and Recreation. Bob Is also the founder and CEO of Navigating for Success consulting firm. He has worked and lived in Ontario, Alberta, BC and Australia. Bob makes his permanent residence in Rossland BC. Laura Nashman has served as Chief Executive Officer of the British Columbia Pension Corporation since December 2008. Laura is recognized as a high-performing senior executive who brings a fresh leadership style to her role. Her focus on, and dedication to, customer service, clear vision and strategic leadership gives her the ability to deliver results. Laura emphasizes the importance of maintaining strong relationships with staff and all key stakeholders. Since joining the Pension Corporation, Laura’s focus has been on developing, strengthening and improving the corporation. She has paid particular attention to business processes, use of technology and building the foundational elements of a high performing organization to ensure the Pension Corporation continues to provide service excellence to plan boards and plan members. Above all Laura is reshaping the culture at the Pension Corporation to set the foundation needed to bring the strategic plan to life. Laura has spearheaded the creation of the strategic plan for the Pension Corporation called 12|21 Our Way Forward. This nine-year strategy is an ambitious plan for business transformation that ensures the Pension Corporation will meet the changing needs and expectations of plan members, employers, trustees and staff. Recently the Pension Corporation, under Laura’s leadership received “Gold” recognition from Excellence Canada. Excellence Canada recognizes organizations that embody the highest standards in leadership and governance, strategy and planning, customer experience, people engagement, process and project management and in relationships with partners and suppliers. In 2017 Laura was recognized by Business in Vancouver magazine as one of their 2017 Influential Women in Business. She was also named as one of Canada’s Top 100 Most Powerful Women by the Women’s Executive Network and recognized on Vancouver Magazine’s Power 50 list; Laura also has the designation of Director with the Institute of Corporate Directors (ICD.D); serves on Excellence Canada’s Board of Directors; and also serves on the Conference Board of Canada Board of Directors. Laura is an active mentor for women leaders and emerging leaders who look to Laura for guidance and direction on their leadership practice and career development. Roger is a partner with the law firm of DLA Piper (Canada) LLP. Since his call to the bar, Roger has developed an extensive practice in trust and estate litigation, often representing various national and local charities and not-for-profits in defending the gifts made to them. He also provides advice to other clients about general commercial litigation and product liability. He has served on numerous boards, including time as the Chair of the national board of the Canadian Association of Gift Planners. Roger has been very active in numerous sports through the years, having achieved a mediocre level of ability in many them. He currently races road bikes at various events in the Pacific Northwest, and has endured enough lab testing to gain some insight into the lives of real athletes. David Graham specializes in strategic planning and governance practices in the not-for-profit sector and is currently the Principal with High Hope Expeditions, a management consulting company for organizational effectiveness and logistics for wilderness expeditions. Previously, David was the Director of Strategic Initiatives for the City of Kelowna where he was responsible for performance management, service delivery improvement, and intergovernmental relationships for the City of Kelowna. Formerly the City Director of Recreation Parks and Cultural Services, he has developed numerous public-private partnerships and capital projects including the new H2O Adventure and Fitness Centre, and Prospera Place. David has a BA in psychology, a BPE, and an MA in Organizational Leadership. David is the former CEO of the YM-YWCA in Kelowna and Prince George and was a founding Director of Pacific Sport Okanagan, and People In Motion. David is a Past President of the British Columbia Recreation and Parks Association, and has served on numerous Boards including the Kelowna Museums Society and PacSport Okanagan. His hobbies include mountaineering, wilderness trekking, cycling, music, and travel. With his son, he made the first Canadian ascent of Pethangtse, a remote Himalayan summit on the border of Nepal and Tibet.